Originally used for race cars and luxury sports cars, low profile tires and becoming a more common sight on Alberta roads. These tires may be on trend right now, but they serve a much greater purpose than simply changing your vehicle’s aesthetic. Read on to learn some of the advantages and disadvantages of having low profile tires. To understand what low profile tires are, you first need to understand how tires are sized. Generally, when looking at tire sizes, you see numbers such as P175/65R14. The first number is the tire’s cross-section width in millimeters. The second number, in this case 65, is the aspect ratio which indicates sidewall height. In this example, the aspect ratio is 65% of the cross-section width (175), giving you a sidewall height of approximately 114 mm. The lower this number is, the shorter the sidewall. Generally, low profile tires are those with an aspect ratio of 55 or less, though this can vary slightly. Improved handling: Low-profile tires have stiffer sidewalls to make up for their reduced height. Combine this with the tires’ larger contact areas and it’s a recipe for increased grip on smooth surfaces and better wheel response. Overall, you end up with a quicker, more efficient tire. Better braking: As the tires themselves take up less space, a larger rim is needed to compensate. In turn, this allows for larger braking hardware to be installed. Larger hardware means more stopping power, which can make a huge difference when you’re driving at higher speeds. Increased fuel efficiency: Short, stiff sidewalls combined with simple tread patterns result in low-profile tires having lower rolling resistance. Lower rolling resistance accounts for better fuel economy. Appearance: Alright this could go into either category depending on your personal preference, but generally people buying low profile tires enjoy the look. 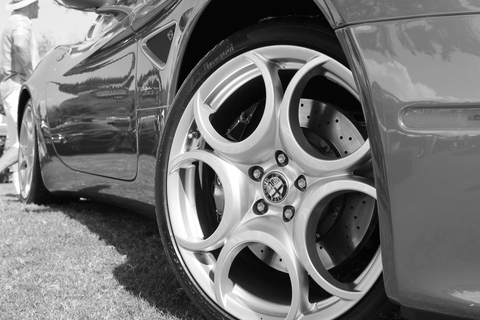 Depending on the type of vehicle you drive, low profile tires can add a sporty or luxury feel. A stiffer, bumpier ride: Running low profile tires puts less space between your vehicle and the road, leaving your suspension system responsible for absorbing the shock of the various bumps in the road. If your suspension system is configured for low-profile tires, then you’re in the clear. However, if not you risk doing some serious damage in addition to taking a loud, bumpy ride. Rapid deflation: While there’s nothing to suggest that low-profile tires get flats more often, they will deflate significantly quicker if a flat does happen. The tires require less air because they are thinner, which means that there’s less air to lose should they be punctured. Damage to the wheels: There’s a lot less cushion between your wheels and rims, and the road. Hitting a pothole that may have caused some discomfort with regular profile tires could actually do some damage when you’re running low profile tires. This can range from bending rims, to puncturing tires, or even more serious wheel issues. Poorer grip on irregular surfaces: The same features that provide excellent handling lead to these tires performing poorly on uneven surfaces such as gravel roads. On wet or icy roads, you’ll find that low-profile tires have similar issues. The simple treads that provide great fuel economy don’t help when it comes to slick road conditions. Ultimately, your driving style along with how you intend to use your vehicle are major factors in determining the type of tires that are best for you. Curious about whether or not you could benefit from low-profile tires? Contact the team at Park Muffler today!